PMB Rotary members helped Project CURE sort medical supplies and pack shipments to Latin America and Africa. Project C.U.R.E. is the largest provider of donated medical supplies and equipment to developing countries around the world (https://projectcure.org/ ). Project C.U.R.E. (Commission on Urgent Relief and Equipment) was founded in 1987 by James Jackson, who was working as an international economic consultant in developing countries when his work put him face to face with the needs of the sick and dying. Since its founding, Project C.U.R.E. has reached patients, families and children in 130 countries. 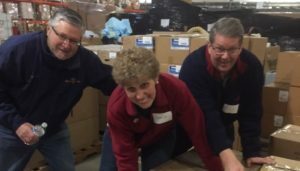 PMB Rotary volunteered at the Project C.U.R.E West Grove, PA warehouse, helping them achieve their goal of shipping 10 shipping containers of medical supplies by May.